We use DPD who specialise in delivering smaller, lighter items anywhere in the UK. If your order consists of only small or light items such as Kitchen or Bathroom Taps, Wastes, Stainless Steel sinks or Waste Disposal units then we can dispatch these using a Premium Service from DPD. If your total order value exceeds £50 then we will deliver these items FREE OF CHARGE to over 99% of Postcodes in ENGLAND. Deliveries to locations within Southern Scotland start at just £6.95 and deliveries to Highlands, Islands and Northern Island start at just £19.95. Smaller items can also be delivered to a select number of International destinations such as Ireland, Spain, France, Germany, Italy and many more. 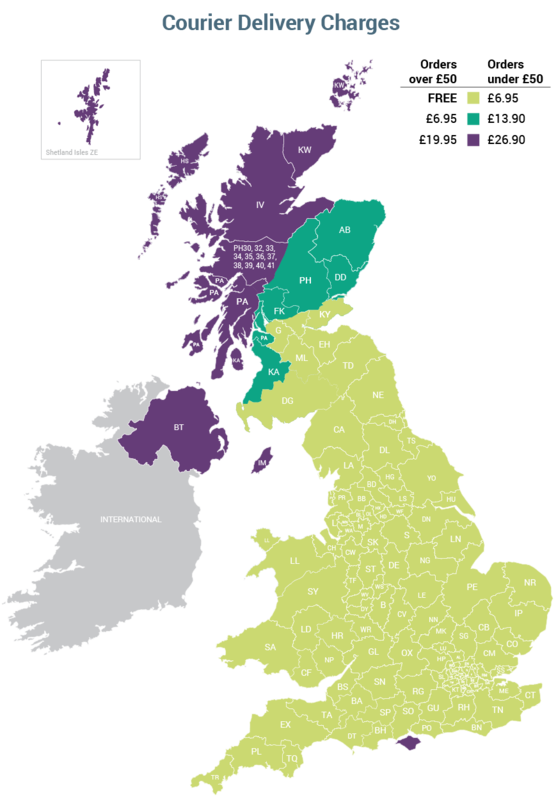 The Delivery Location Map shows all the UK destinations along with a key showing any relevant charges (Click image to enlarge). We use TPN who specialise in delivering large, heavy or fragile items anywhere in the UK. If your order includes any items any such as Kitchen or Bathroom sinks made from Granite, Glass or Ceramic, Bathroom Cabinets, Showers enclosures or Kitchen Appliances then we dispatch these using a number or Premium Services from TPN. If your total order value exceeds £50 then we will deliver these items FREE OF CHARGE to around 80% of Postcodes in ENGLAND. Larger items can also be delivered to a select number of International destinations such as Ireland, Spain, France, Germany, Italy and many more.